Workers install a Firestone RubberGard R.M.A. System, an EPDM roof. Firestone makes both EDPM and TPO roofs. When it comes to roofing, one size does not fit all. A plethora of options dictate what kind of membrane, level of insulation and installation method should be used in the construction process. But one choice seems to spark more debate than the rest: The battle of black versus white, as in black EPDM surfaces against white reflective—usually thermoplastic polyolefin or PVC—membranes. Each has its advantages and works in a variety of situations. But to do so, a number of other variables must be taken into account and, in some cases, overcompensated for. 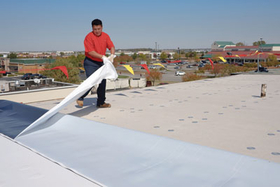 When membrane—or any roofing variable—gets promoted as a quick environmental fix, the EPDM Roofing Association takes exception. Jeff Henegar, director of research and development, Firestone Building Products, said the typical break line for using white versus black is the Mason-Dixon Line. According to Weather Data Depot's calculator—and using a commonly adopted standard base temperature of 65°F—in 2012 Chicago had 5,166 heating degree days to 1,262 cooling degree days. New York City had 4,068 heating days to 1,195 cooling, and Pittsburgh had 4,837 heating days to 972 cooling days. Generally speaking, buildings in those cities spend more time keeping their respective buildings warm than cold. And all three cities are making a push for expanded use of white reflective roofs. Henegar said either membrane can be effective, but that doesn't mean it is necessarily the best choice for the situation. Cities have a growing concern for what's called the urban heat island effect, citing studies that show excess heat generated by the structure of the city—human activity and the presence of dark, impermeable surfaces—traps heat within the city and raises its temperature in comparison to the surrounding rural areas. White roofs are being push-ed as a way to combat this effect. The Global Cool Cities Alliance is a non-profit founded in 2010 that works with cities around the world on understanding the issues around urban heat islands. It works with cities to identify whether or not it has a heat island and how big it is, and it connects the city to experts in the industry to develop strategies to help mitigate that heat island. According to Executive Director Kurt Shickman, the most economical of those options is cool roofing. At the same time, Chu and President Obama committed to reduce its greenhouse gas emissions 28 percent by 2020. Chu directed all DOE offices to install cool roofs when constructing new roofs or replacing old ones on DOE facilities, whenever cost effective. With the federal government taking the lead, other cities have followed suit, even those in the northern climates. “There is certainly concern among manufacturers, JM included, that legislation brought to light too fast may not offer the best solution for people in those regions,” said Rick Gustin, product manager for EPDM at Johns Manville Inc.
Chicago was ahead of the curve. The city implemented an ordinance in 2008 requiring most new roofs and roof renovations to use white reflective materials. The ordinance was updated to include ballasted roof systems. New York City recently strengthened its building code to require expanded use of white roofing material. It also established the NYC CoolRoofs Initiative, a program that paints black roof surfaces with a white reflective paint designed to help reduce energy use. While white roofs are not required by the state of Pennsylvania, they are beginning to gain traction in Pittsburgh. The Children's Museum installed a white roof in 2004 as part of a museum expansion program, and earlier this year the city launched its own cool roofs program to paint the surfaces of 10 city-owned buildings with reflective paint. Mike DuCharme, director of product marketing at Carlisle Syntec, doesn't think paint programs make sense in the northern climates. He cited a study that demonstrated a higher degree of moisture accumulation among white roofs in northern climates when compared to black EPDM counterparts. If all things are equal, changing the coating of the roof changes the dynamics of the building. Thorp said if facility managers want to change the color of a roof, they must take into account the number of occupants, type of insulation and the assembly. 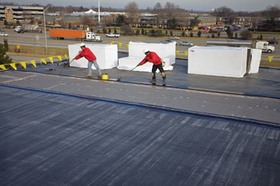 A worker installs Firestone's UltraPly TPO roofing membrane. The membrane color is only one part of the roofing equation. Each roofing manufacturer stressed that insulation plays a bigger role in making environmental strides. The American Society of Heating, Refrigerating and Air-Conditioning Engineers is one regulatory body that mandates a minimum amount of thermal resistance insulation that products need for a building to meet code. The minimum required thermal resistance of a product—or R-value—is calculated based on climate zone. Most minimum standards start at R-20 for the warmer zones in the U.S. and usually reach around R-35 for the colder ones, but cities and municipalities can raise the minimums on their own accord. Henegar said from the minimum R-value, designers can add more layers of insulation to increase the building's conservation of energy, minimizing the impact of the choice of membrane color. DuCharme said that on average, when using an EPDM roof in the southern climate or a white reflective roof in the north, insulation should be increased by an R-value of 3-5, which isn't a huge burden on the cost of the roof. However, the need to overcompensate for condensation can impact the cost of a white roof in a northern climate. Henegar said the real impact of white roofing is the potential for reflectivity to take some of the thermal load off in the summer, but in areas with cold winters it offers no real value one way or the other. He said there are arguments that darker roofs make more sense in colder climates because it helps melt the snow off and take some of that burden off the roof structure. And that's where the cost goes up. DuCharme said that white reflective roofs have a higher potential for condensation in colder climates and usually has to be combated with an air barrier. He estimates that an air barrier could add as much as 30 percent to the cost of the roof. A black EPDM roof has the ability to handle temperature swings better, is more flexible and absorbs heat in the winter months, which DuCharme said minimizes the accumulation of ice and moisture. TPO does not have the history of EPDM. Gustin said the jury is still out on whether or not total lifecycle costs of the product will wind up being superior to EPDM. Ultimately, the ERA stresses that no one variable can determine whether or not a roof will be energy efficient or cost effective. What works in one state cannot be applied universally across the U.S. because of variances in climates, building sizes and frequency of use.